​Roman re-enactment clubs around the world typically adopt the name of a real ancient Roman legion. We have chosen the Legio 6th Ferrata ("iron-clad") that has the motto “Fidelas Constans” (Loyal and Steadfast). Our emblem is the Bull, and our Birth Sign (the time of year the legion was first founded) is Gemini, symbolised by the Roman She-wolf and twins (Romulus and Remus), the original founders of Rome. ​In 65 BC the Roman senate authorized Pompey the Great to recruit in mass 36,000 Spanish troops from the Roman province of Near Spain to form the 4th, 5th, 6th, 7th, 8th, and 9th legions. The 6th legion, known as VI Hispania, garrisoned eastern Spain and from 55-52 BC conquered the wild Celtic tribes of Lusitania (modern Portugal). Meanwhile, Julius Caesar conquered Gaul, but when Vercingetorix led a revolt, Pompey lent the 6th legion to help Caesar. Vercingetorix was defeated at the Siege of Alesia, but some die-hard rebels continued to fight on. In 51 BC the 6th legion conducted the Siege of Uxellodunum that was ultimately successful by cutting off the town's water-supply. This was the last action of the war, and Caesar made an example of the rebels by cutting off all their hands. After this terrible lesson, the Gauls never revolted again, even when they had ample opportunity during the Civil Wars. In 50 BC, Pompey ordered the 6th legion back to Spain for discharge and reenlistment because their 16 years of service was now up. Caesar paid every soldier a bribe of 1,000 sesterces per man (their annual salary was 900 sesterces) hoping to win their favour. In 49 BC, just before the 7th, 8th, and 9th Legions were also due to receive their 16-year-discharge, Caesar illegally crossed the Rubicon River to invade Italy, which started his Civil War against Pompey and the senate. Pompey abandoned Rome to gather his forces in Greece, so Caesar decided to first march against Spain, boasting, "I will defeat an army without its general, and then I will defeat a general without his army!" Pompey's army in Spain consisted of the 3rd, 4th, 5th, 6th, and Valeria legions. After some hard fighting, they were outmaneuvered and forced to surrender. Caesar allowed all soldiers that wanted to be discharged to go home, provided they swore an oath not to oppose him again, and even paid them their back pay, by borrowing from his own officers. Caesar also released the general Afranius, but Afranius then treacherously recalled 3500 of his best Spanish soldiers, to form three cohorts of the 4th and four cohorts of the 6th legion, which he took to Pompey in Greece. Afranius thought that Pompey would be pleased he had brought him more troops, but Pompey was instead outraged to learn Afranius had lost his entire army in Spain. Pompey had only two experienced legions, his crack 1st legion, and the 15th that had been raised by Caesar to conquer Gaul, but the rest of his army were all raw recruits. Even most of the vaunted 1st had only joined Pompey’s most elite legion at its latest reenlistment three years back and had no combat experience. Pompey ordered the 4th and 6th to act as a single unit, but each with their own eagle standard. Previously, before they left from Gaul, Caesar had paid the soldiers of the 1st a bribe of 250 sesterces each, whereas the 6th he had paid 1000 sesterces each - but this wasn't because he valued the 6th more, it was only because he was running out of money! Arriving in Greece, Caesar laid siege to Pompey at the Battle of Dyrrhachium, but was repulsed and forced to flee. The historian Suetonius mistakenly wrote that the 6th fought for Caesar at this battle, when it was actually the 9th legion. Pompey caught up with Caesar at Pharsalus, and wanted to simply starve him out, but the foolish senate insisted on fighting a battle because they were so certain of victory and threatened a vote to replace Pompey as commander. In 48 BC, at the Battle of Pharsalus, Caesar had a veteran army of about 20,000 men and 2,000 cavalry. Pompey had an untested army of about 45,000 men and 6,000 cavalry. Pompey sent his cavalry to outflank Caesar, and Caesar countered with cohorts directed to stab their pila into the enemy faces, which caused them to break and flee. Pompey had stationed the veteran 4th and 6th legions on his right-wing, the most dangerous and crucial position in battle (because soldiers carry their shields on their left, which leaves the right side exposed and vulnerable). When Pompey's army broke and fled, the 2000 men of the 6th still held their ground in good order, enabling the 4th legion to escape across the river, along with half of the 6th and their eagle, but the rest were surrounded. Caesar promised they would be unharmed if they surrendered. Caesar ignored the fact that the 6th had previously made a moral choice to fight against him for Pompey and the republic, and had not been swayed by the bribe he’d paid them. He was in need of good fighting men, so probably offered them another bribe of around 20,000 sesterces each to help him defeat Pompey. They agreed on condition that the 6th would continue to march under its own eagle, without any new recruits added from other units, and that they would not be forced to fight against their old comrades of the 6th that had escaped. So now there were two 6th legions - the first comprising 6th Ferrata of 1000 men that now agreed to fight for Caesar, and the second 6th Victrix of 1000 men that escaped with the remains of Pompey's forces to Africa. The 6th Ferrata sailed with Caesar to Egypt in pursuit of Pompey. In Alexandria they found the Egyptian boy-king Ptolemy had decapitated Pompey whose head he presented as a gift to Caesar. Caesar decided to depose Ptolemy, and sent a contingent of the 6th to kidnap his sister Cleopatra, which started the Egyptian War. Caesar's small force was surrounded by the entire Egyptian army, holding on desperately for reinforcements, before finally victorious in the Battle of the Nile to conquer Egypt and place Queen Cleopatra on the throne. Caesar now uttered his famous motto: "Veni, vidi, vici!" (I came, I saw, I conquered!). He also dryly commentated that Pompey was very lucky indeed to have been given the title of "the Great" for his eastern conquests "if he was fighting rubbish like this!" The victorious 6th Ferrata returned to Rome, where they waited while Caesar invaded Africa in 46 BC, since they did not want to fight their old comrades in the 6th Victrix. The Pompeian forces were led by general Scipio, who swelled the ranks by recruiting slaves to fight. The shame of fighting alongside slaves so disgusted the proud veterans of the 6th Victrix that they defected to fight for Caesar. They were victorious at the Battle of Thapsus, but again Pompey's 1st legion escaped, this time to Spain. Caesar returned to Rome to hold four triumph victory parades. The 6th Ferrata marched in the triumphs for the Gallic, Egyptian, and Pontic Wars, but not in the African. Caesar rode through Rome in his gilded chariot preceded by his lictors bearing his fasces entwined with laurel, the symbol of victory for a conquering general. Behind came prisoners taken in his campaign, all in chains, with their leaders prominent. Then came the spoils of war displayed on a succession of wagons, followed by more wagons bearing stage sets and large paintings depicting the battles, like floats in a modern-day parade, all with inscriptions in large letters so the public knew what they were looking at. Last of all came soldiers representing the general’s army that had won the victory. These soldiers were permitted to march along the processional route singing bawdy ditties about their general, receiving the adulation of the cheering, applauding crowd as they passed. Caesar then proceeded to Spain to fight the last of the Pompeians. The 6th legion was present at the final action of the Civil War, the close-fought Battle of Munda where Caesar said, "Usually I fight for victory - today I fought for my life!" Once again the 6th marched through Rome, this time in Caesar's Spanish triumph. Following these campaigns, Caesar was true to his word, and the 6th Ferrata were amply rewarded. The veterans were settled in prime farmland in France at Arles, named Colonia Iulia Paterna Arelatensium Sextanorum ("the ancestral Julian colony of Arles of the soldiers of the Sixth"), even though they now comprised only about 900 men, when veterans colonies usually comprised of about 3,000 men. Caesar now planned to go conquer Parthia in revenge for the defeat of Crassus at the Battle of Carrhae. He ordered new enlistments to be raised for all legions, including the 6th Ferrata. Some of the old veterans reenlisted as centurions. The second 6th legion Victrix was also brought up to full strength. However in 44 BC, before the war could commence, Caesar was treacherously assassinated. Caesar's Sixth Legion - online book file describing the history of the 6th legion in detail. ​​Following Caesar's assassination, the retired veterans of the famous 6th Ferrata at Arles rejoined their legion, which was part of Marcus Lepidus’ army then in camp at the Var River, not far from Arles. The veterans were called up to honor the terms of their discharge and serve for up to four more years in emergencies. Caesar's designated heir, his grandnephew Octavian, allied with Caesar's generals Marc Antony and Lepidus to form the Second Triumvirate of three-man-rule. In 42 BC their united forces, including the 6th, defeated Caesar's assassins, Brutus and Cassius, at the Battle of Philippi. Legionary Lucius Labicius Celer - his tombstone is on the Via Appia east of Benevento and is the only one of all the 6th Legion epitaphs to include the title "Ferrata" in its inscription. This is also the earliest use of the cognomen celer ("swift") by a legionary. The first celeres were the legendary bodyguards of Romulus, the Founder of Rome. There were not found any 6th tombstones of centurions, or even of standard-bearers. Maybe they remained in the army, since one in five veterans did choose to continue service with the legions after Philippi, or perhaps they were given better land elsewhere. Former centurions were regularly appointed to serve as lictors for magistrates, so maybe the 6th Ferrata officers took up such official posts at Rome and other large cities once they received their military discharges. The Second Triumvirate decided that Octavian would rule the west from Rome, while Antony would rule the east from Alexandria. As part of Antony's legions the 6th Ferrata was sent to Judea, while Octavian stationed the 6th Victrix in Spain. In 38 BC, Antony's general Ventidius won a huge victory over the Parthians in which the 6th Ferrata played a leading part. Ventidius was ordered back to Rome to celebrate a triumph over the Parthians, the only Roman general ever to do so, and once again the victorious 6th Ferrata paraded through Rome. Antony took over command of the Parthian War, with sixteen legions including the 6th, but in his rash haste the Parthians destroyed his weakly-protected siege-engines, and with no way to capture the fortified cities, he was forced to retreat with heavy losses. Just as at Mutina, Antony was able to retire from this disaster keeping about a third of his army intact (unlike Crassus who had been almost completely destroyed) so that it was said of Antony that "there was no better general in retreat." In 31 BC, at the naval Battle of Actium, the 6th Ferrata fought for Antony, and the 6th Victrix for Octavian. Antony and Cleopatra were defeated, and later committed suicide, leaving Octavian sole ruler of the Roman world, and now claiming the title Augustus ("revered-one"). ​Marc Antony issued silver legionary denarii such as these to pay his legions and fleet, prior to the Battle of Actium (32 BC) and likely minted at his winter headquarters of Patrae (Greece). With a lower silver content (copper having been added to the alloy) or even silver washed (fourré), these debased coins tended not to be hoarded but were in constant circulation and so are most often found in very worn condition or with bankers' assay marks. Seeking to associate himself with Julius Caesar, who had held the augurate, Antony too identified himself as augur; so one reads ANT•AVG (abbreviating Antonius augurus); III•VIR•R•P•C abbreviates Triumvir rei publicae constituendae ("One of Three Men for the Restoration of the Republic"), which was adopted in 43 BC by Mark Antony, Octavian and Lepidus when they formed the Second Triumvirate. Right: The club has a copy of this coin. In 30 BC, Augustus stationed the 6th Ferrata at Raphaneae in Syria as a permanent check on the Parthians. They were under the command of the Syrian governor in Antioch, along with three other legions - the III Gallica, X Fretensis, and XII Fulminata. In 20 BC, Augustus' stepson Tiberius (and later successor) employed these units to impress the Parthians, so that they signed a peace treaty and as a token of goodwill returned the eagle standards they had captured at the Battle of Carrhae. In 4 BC, the governor of Syria, Publius Quinctilius Varus, used three of these legions to suppress the rebellions of the Jewish messianic claimants Judas, Simon, and Athronges following King Herod's death. The 6th Ferrata shared their base at Raphaneae with the 12th legion for several decades. 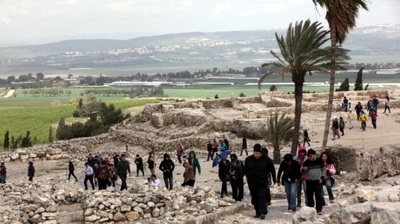 Veterans were later settled at Ptolemais (Acre). In 54 AD, the emperor Nero ordered Corbulo to recover Armenia from the Parthians, using the 6th Ferrata and the 10th Fretensis. Finding both units lamentably run down after years of inactivity, he discharged their most unfit and elderly men and instituted a draft among young Roman citizens in Cappadocia and Galatia to fill the empty places. This was highly unusual, because legions normally replenished their ranks only at their twenty-year discharge and reenlistment. This meant that in future the 6th Ferrata would have two discharge and reenlistment dates during each twenty-year span, with part of the legion being discharged and reenlisted every ten years thereafter. Corbulo marched the two legions and half the Syrian station’s auxiliary light infantry and cavalry up into the mountains of Cappadocia, where he trained them relentlessly for four years. In 58 AD, Corbulo's army swept unexpectedly into Armenia, drove out the Parthians, captured the capitals of Artaxata and Tigranocerta, and installed a pro-Roman king, Tigranes (a great-grandson of King Herod). Four years later the Parthians counter-attacked and placed King Tiridates on the throne. In 63 AD, the governor of Cappadocia, Lucius Caesennius Paetus, marched with the 12th Fulminata and 4th Scythica, but the Parthians forced them into surrender at Rhandeia in disgrace. Corbulo and his army (that included the 6th) were able to turn the tables, and ordered King Tiridates to receive his crown for the second time from the Roman emperor Nero. The 6th Ferrata stayed in Armenia for some time to enforce the peace, before returning to Syria. The new Roman commander appointed by the emperor Nero to put down the revolt, Titus Vespasianus, who would become the Roman emperor Vespasian, recovered Galilee and most of Judea between 67-9 AD. His son Titus finally took Jerusalem in 70 AD after a bloody siege that ended with the destruction of the Jewish Temple. The 6th Legion played no part in these later Judean operations, sitting out the last three years of the Jewish Revolt at their base at Raphaneae, anxiously watching the Euphrates in case the Parthians decided to invade Roman territory while the Romans were focused on defeating the Jewish rebels. The 6th was in fact the only legion guarding against a Parthian attack, but the Parthians, knowing that another half dozen legions and elements of several others were close by in Judea and Egypt, and that the very capable Vespasian was in command, made no move to threaten Roman territory. Following Nero's suicide, 69 AD was the Year of the Four Emperors, comprising first Galba, then Otho, and then Vitellius, commander of the German legions. Vespasian decided to challenge, when the legions in the East and several on the Danube and in the Balkans swore allegiance. With all the legions of the region but the 6th engaged in the siege of Jerusalem, when the governor of Syria, Licinius Mucianus, agreed to lead a force from Syria to Rome to make Vespasian emperor, the 6th Ferrata was the only legion available for the daunting task. To support the 6th, Mucianus called up 13,000 retired legion veterans living in Syria to march behind their Evocati militia standards, and assembled a number of auxiliaries, creating a force of some 25,000 men. Mucianus led the 6th and the remainder of his force overland from Syria, through the provinces of the East, across the straits from Asia to Macedonia, then up through the Balkans. While Mucianus was on the march, units in Moesia, today’s Bulgaria, and elsewhere in the Balkans were advancing into Italy to take on the forces of the emperor Vitellius for Vespasian, led by the ambitious Primus Antonius, commander of the 7th Galbiana Legion. Mucianus sent orders ahead for Antonius to wait for him and the 6th Ferrata at Aquileia in northeastern Italy while he backtracked to fight a horde of opportunistic mounted Sarmatian raiders that had flooded across the Danube into Moesia behind their backs, killing the province’s Roman governor and overrunning auxiliary outposts before pillaging and occupying Roman settlements. Mucianus and the 6th Ferrata swung north, and marched for the Danube to take on the Sarmatian invaders. The details of this campaign are sketchy, but the action was so rapid and the fighting so decisive that the surprised Sarmatian cavalry suffered thousands of casualties. The bloodied Sarmatian survivors quickly fled back across the Danube, while the 6th Ferrata seems to have suffered only minimal losses. Meanwhile, Antonius hadn’t waited for Mucianus as instructed. Marching down into Italy, his pro-Vespasian forces had defeated Vitellius’ army at Cremona and then continued on to Rome itself, crossing the Apennines through heavy snow and then, led by the 3rd Gallica Legion, taking the capital in a day of bloody fighting. When Mucianus and the 6th Ferrata arrived a few days later, Vitellius had been killed, his army had surrendered, and Vespasian was declared emperor. In 70 AD the 6th Ferrata marched back to its station in Syria. Mucianus, now acting as Vespasian’s tough right-hand man, was voted a Triumph by the Senate for the 6th Ferrata’s victory over the Sarmatians on the way to Italy. The veterans of the original 6th had long since made old bones, at Benevento, Arles, and elsewhere, but the story of the gallant deeds in Egypt and at Zela of Cleopatra’s kidnappers and Pharnaces’ destroyers would have been told to each new enlistment of the 6th when they joined the unit, by their centurions. The strong esprit de corps of the legions was founded on such battle honors. But this time the men of the 6th would not be parading through the streets of Rome. Instead of a street parade, Vespasian awarded Mucianus all the honors associated with a Triumph, including the cash prize, Forum statue, and so-called Triumphal Decorations—the cloak, bay leaf crown, and laurel branch. In 71 AD, Paetus, the Roman general who had disgraced himself in Armenia 15 years earlier, came back to Syria as the province’s governor. Two years later, seeking glory at home to rank him with the likes of Mucianus, he invaded the friendly allied state of Commagene with the 6th Ferrata, on the pretext that the king, Antiochus IV, was planning to change allegiance to the Parthians. Paetus had written to Vespasian to say that he had intelligence to this effect, and sought Vespasian’s permission for the operation. Although Vespasian was surprised, for Antiochus had been a model client and ally until then, he told Paetus to do what he thought best. That was all the invitation needed by Paetus, who was looking for a Triumph. The Commagenian king’s sons attempted to resist with their small local army, but they were no match for the 6th Ferrata who captured the capital of Samosata, and the little war was quickly over. The whole affair proved an embarrassment to Vespasian, but he could not lose face and reverse matters. The best he could do was allow the ousted King Antiochus and his family to live in exile at Rome, while Commagene became a Roman province. For his pains, Paetus earned himself no Triumph. In 101-6 AD, a vexallatio of the 6th Ferrata participated in the emperor Trajan’s conquests of the Dacian Wars, as depicted on Trajan's Column in the Roman forum. In 113-6 AD, Trajan used his eastern legions to reclaim Armenia from yet another Parthian invasion, annex Mesopotamia and the Nabataean part of Arabia, and briefly occupy the Parthian capital, Ctesiphon, bringing the Roman Empire to its greatest ever extent. Inscriptions for the 6th legion record that Trajan decorated a legate, a centurion, and a tribune (who received a headless spear and a mural crown). Trajan had two triumphal arches built in Italy to celebrate his military victories. One was built at Benevento, where it still stands today. Why Benevento was honored with the arch we can only speculate. Perhaps the 6th Ferrata performed so creditably for Trajan in his battles against the Parthians that he chose to honor the town that was the traditional settling place of veterans of the 6th. By 119 AD the 6th Ferrata had left its longtime base at Raphaneae, taking up a new permanent station in Arabia, from where it invaded Judaea to put down the Second Jewish revolt of Simon ben Kosiba between 132-6 AD. This was a grueling campaign in which thousands died on both sides before the revolt was finally crushed and Jews were permanently banned from all of Judea. After this war, the Sixth stayed in Caparcotna in Galilee, which was soon surnamed "Legio" (modern Lejjun). A detachment may also have been stationed in Jerash, Jordan, according to an extant inscription. The 6th briefly served in Africa under the emperor Antoninus Pius (138-161 AD), where it built a road. Later, when a new war broke out between Rome and Parthia, the emperor Lucius Verus employed the 6th in Mesopotamia (162-165 AD) and it was probably involved in the capture of Ctesiphon, the capital of the Parthian empire. Marc Antony's original legionary coins were still in circulation. In 169 AD, Marcus Aurelius and Lucius Verus made an over-struck reissue, all of which honored only one legion - Legio VI Ferrata. However, the original inscription of ANT•AVG was changed to ANTONIVS•AVGVR to avoid confusion (since AUG had now come to mean AUGUSTUS). Silver legionary denarius, restitution by Marcus Aurelius and Lucius Verus. 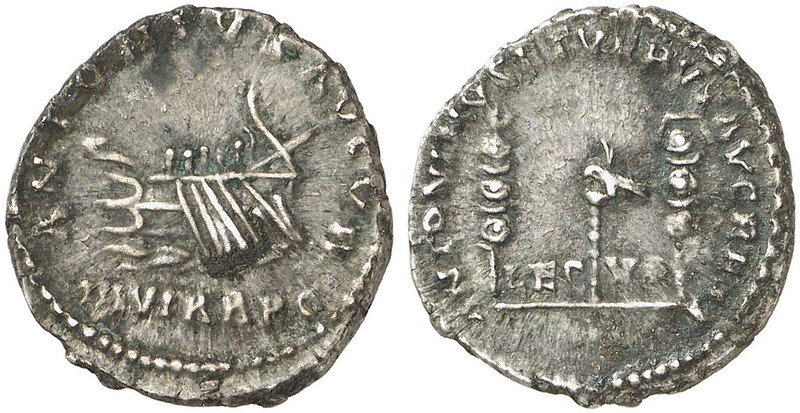 Obverse ANTONIVS•AVGVR / III•VIR•R•P•C, galley left with rowers; reverse ANTONINVS ET VERVS AVG REST / LEG•VI, aquila (legionary eagle) between two legionary standards. In 193 AD, the 6th Ferrata defeated Pescennius Niger to install Septimius Severus as the Roman emperor. Severus awarded Ferrata the title of FC, Fidelis Constans (loyal and reliable), but punished the legion X Fretensis at nearby Nablus for supporting Niger. In 197-8 AD, the 6th defeated the Parthians after they invaded Mesopotamia. Under Severus, the single men of the legions were for the first time permitted to marry while still serving in the army. Severus also increased the basic rate of pay for legionaries, their first pay raise in more than a century. By early in the third century, the 6th’s Ferrata title had become official, and this may have been because of the legion’s loyal service to Severus. ​In 215 AD, the 6th Ferrata was still in Palestine. It is possible that Severus Alexander (222-235) transferred it from Galilee to Phoenicia. It is certain that the 6th Ferrata was still in existence during the reign of the Roman emperor Philip the Arab (244-249) because he minted coins bearing the name of Legio VI Ferrata. They are very rare, and show a she-wolf suckling the twins under the standard. The later history of the 6th Ferrata is not known. 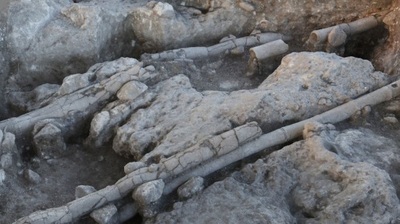 ​The remains of the Legio VI Ferrata camp has been discovered in the Jezreel Valley in modern Israel, in the vicinity of Meggido. In 2013, the archaeological team uncovered defensive earthworks, a circumvallation rampart, barracks areas and artifacts including roof tiles stamped with the name of the Sixth Legion, coins and fragments of scale armor. Excavations are ongoing each season, and it is possible to volunteer to join as part of the upcoming dig-team if you wish. Julius Isidorianus, first centurion of the Sixth Legion Ferrata, the reliable one, the Antoninian one, [dedicated this] to the health and prosperity or our lord Caracalla, with the great god Serapis. The 6th Ferrata’s twin, the second 6th, remained in the West throughout its career. Based in Nearer Spain from 40 BC, they fought in the Cantabrian War of 29-19 BC in northern Spain, which resulted in the final conquest of all of Spain for Rome. In 6 AD they marched to the Balkans to fight in the Pannonian War that subdued the revolt of Pannonian and Dalmatian partisans. As a result the legion was officially granted the title Victrix (“Conqueror") by the emperor Augustus, and officially known as the 6th Victrix thereafter. In 69 AD, the Year of the Four Emperors, the governor of Nearer Spain, Galba, marched on Rome with a new legion he’d raised in Spain, the 7th Galbiana, and left the loyal 6th Victrix behind to control Spain in his name. Galba took Nero’s throne to became the first Roman emperor without any family connection with Caesar. He was assassinated by Otho, who was defeated by Vitellius, until finally Vespasian was victorious as emperor. In 70 AD, a new enlistment of the 6th Victrix Legion led by Sextus Caelius Tuscus was sent to Mainz to help defeat a Gallic uprising led by a Batavian auxiliary commander, Julius Civilis, who had served with Vespasian in Britain. The Civilis Revolt had resulted in the loss of all Roman bases on the Rhine from the North Sea to Switzerland. Petilius Cerialis promoted the 6th’s tribune, Gaius Minicius, to commander of one wing of the Singularian Horse, the regiment of German cavalry created the previous year to serve as the emperor’s household cavalry, the mounted arm of the Praetorian Guard. Minicius led the Singularians in an action that resulted in a spectacular victory for Cerialis’ army against the rebels beside the Rhine in the Battle of Old Camp. The recently recruited troops of this enlistment of the 6th Victrix performed creditably in the battle, although they advanced too eagerly at one point and it took the 14th Gemina Legion, then the most famous legion in the Roman army, to come up on their flank and drive the enemy back. Civilis surrendered, and the 6th Victrix stayed on the Rhine, based at Neuss in Germany. During Trajan’s reign it moved to Vetera, today’s Xanten in Holland. In 122 AD the 6th Victrix was hurriedly transferred to Eburacum (modern York) in Britannia, to replace the 9th Hispana Legion, which had mysteriously disappeared, apparently wiped out by Celtic invaders from Scotland. In 395 AD, the other two legions stationed on the island, the 2nd Adiutrix and the 20th Valeria Victrix, were withdrawn to help defend Gaul and Italy from the barbarian invasions. In 406 AD, the 6th Victrix became the last legion to be pulled out of Britain. Despite repeated requests from the Britons for Roman legions to help fight off raiders from Scotland, Germany, and Scandinavia, no legion ever returned to Britain, and the locals had to raise their own troops and organize their own defense. 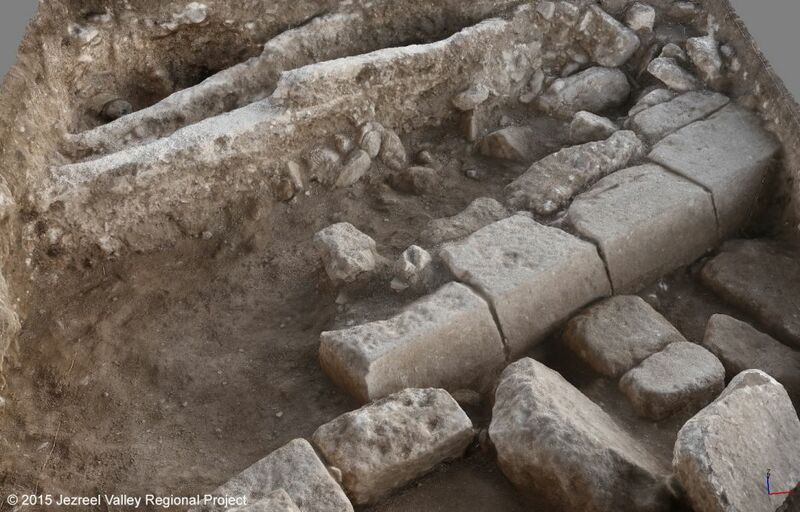 The remains of an imperial Roman legionary camp — the only one of its kind ever to be excavated in Israel or in the entirety of the Eastern Empire from the second and third centuries CE — have come to light at a dig near Megiddo, archaeologists said this week. Legio, a Roman site situated next to Tel Megiddo in northern Israel, served as the headquarters of the Sixth Legion Ferrata — the Ironclad — in the years following the Jewish Revolt, and would have helped keep order in the Galilee during the Bar Kochba Revolt in 132-135 CE. “It’s a very, very exciting find,” Yotam Tepper, co-director of the excavation and a field archaeologist at the Israel Antiquities Authority specializing in the Hellenistic and Roman periods, said in a phone interview Monday. The dig, now in its second season, was conducted by the W.F. 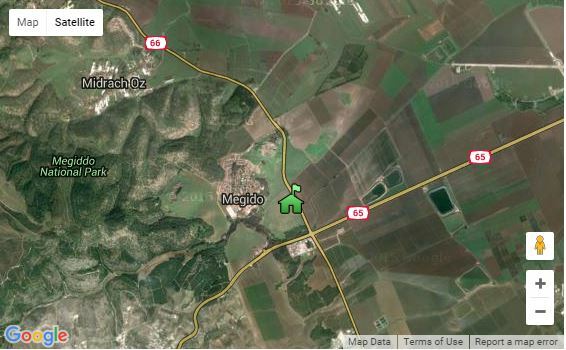 Albright Institute of Archaeological Research with support from Israel Antiquities Authority as part of the Jezreel Valley Regional Project. In the century following the Jewish Revolt in 66-70 CE, Rome garrisoned two imperial legions in Palestine to keep order, one in Jerusalem and a second in the Galilee. Until recently, the location of the castrum — Latin for a permanent military camp — housing the Sixth Legion was uncertain. The erstwhile presence of a Roman legio was preserved in the name of an Arabic village nearby — Lajjun. But surveys and aerial studies of the site by Tepper in recent years pointed to the presence of a Roman military structure, and during the first season in 2013 the team found the first evidence of the military camp. 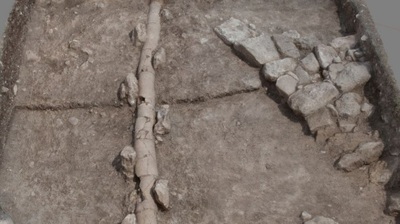 This season’s excavations have unearthed large numbers of ceramic roofing tiles marked with the sign of the Sixth Ironclad Legion, clay pipes, sewer channels and several buildings, all of which attest to the high level of planning at the site. 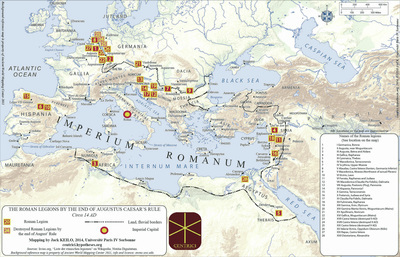 The number of Roman military camps of this type found in the eastern half of the Roman Empire “is zero,” said Matthew J. Adams, head of the Albright Institute and co-director of the dig: “Our entire understanding about Roman military architecture, and especially Roman legionary bases for this particular period… comes from the western empire — Germany, Britain and Gaul.” Remains of other Roman military installations, like the siege camp at Masada, were temporary, and of a smaller scale than the Megiddo castrum. The new finds contribute to a better understanding of Roman military architecture and engineering, and are “rare and unique in the Roman East,” said Tepper, Adams and Jonathan David, deputy director of the JVRP, in a statement. “In the aftermath of the first revolt, you had the beginnings of a lot of emigration of the Jewish population of Judea northward,” Adams explained. “The Galilee was increasingly the center of Jewish activity.” In light of the bloody first century revolt which took Rome four years to crush, “probably one of the reasons that they brought the legion here at all was to garrison this unruly population,” Adams said. 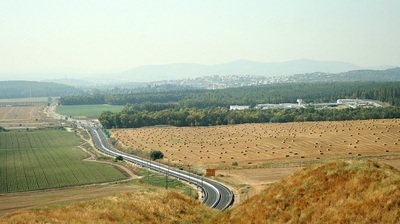 Megiddo sits at a historic crossroads connecting the coastal road and the main highway running inland toward the Sea of Galilee and Damascus. “Control of the Galilee can very much be had from this particular location, as it had been for centuries, that’s why Tel Megiddo is here from the Bronze Age onwards, ” he said. 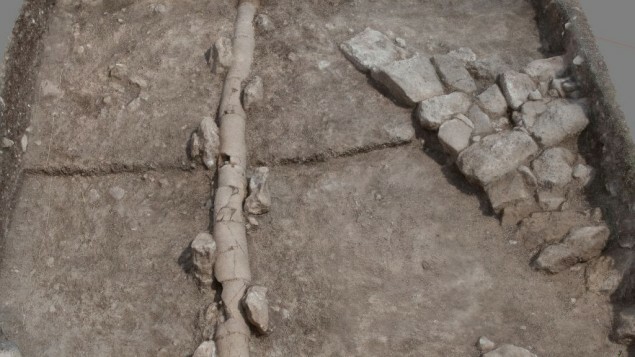 The legionary fortress would have also served as “point zero” for development of Roman roads, aqueducts and other infrastructure in the Galilee during the second and third centuries, Tepper said. The location may have been chosen for its strategic position, as well as the presence of large sources of year-round water in the vicinity. Legio served not only to protect but to project Roman power. 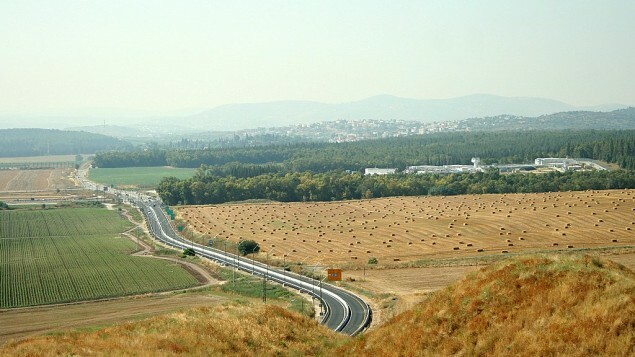 Adams noted that whereas the first Jewish revolt against Rome in the first century CE was waged in the Galilee and farther south in Judea, the Bar Kochba Revolt of 132 CE mostly took place in the hills near Jerusalem and comparatively less in the north. “Considering the fact that the first revolt had a lot of its origins in the northern half of the country, it’s surprising that during the Bar Kochba Revolt the Galilee did not seem to be involved. And that’s probably because the Roman legion was here,” he said. “This is the first time we had the opportunity to understand how the Roman military was organized, in terms of their settlement especially, in the eastern empire,” Adams said.